Magnet-Karte Fur Die In 4 Jahren Beobachteten Werthe Der Declination. 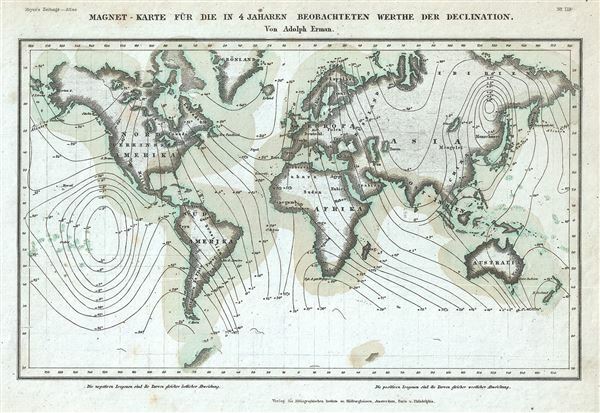 This is a fine 1852 Meyer map or chart of the world magnetic declination showing observed magnetic measurements for the last four years by Adolf Erman. Magnetic Declination, or as it is more commonly known Magnetic Variance, refers to the difference between true north and compass north. Magnetic variance changes both over time and from place to place, consequently accounting for compass errors was a major obstacle for many early cartographers. The map also notes that the negative Isogonals are the curves of equal easterly deviation, while the positive Isogonals are the curves of equal western deviation. This map was issued as plate no. 119 in Meyer's Zeitung Atlas. Although all the maps in this atlas are not individually dated, the title page and maps were often updated while the imprint with the date was not, causing confusion to the exact date for some of the maps. Moreover some maps in the atlas were taped in at a later date as an update to the atlas. We have dated the maps in this collection to the best of our ability.